Chopper #3 is now available for pre-order in the Diamond PREVIEWS December catalog. This exciting five-issue horror series is published by Asylum Press. 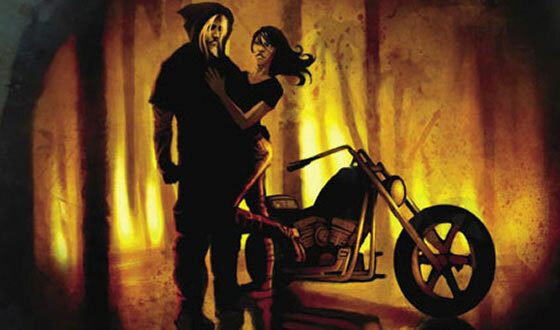 Written by screenwriter Martin Shapiro and drawn by acclaimed artist Cliff Richards (Buffy the Vampire Slayer, Batman: Time and the Batman, Pride and Prejudice and Zombies), Chopper is a modern-day reimagining of the headless horseman of Sleepy Hollow fame. In issue #3, Christina tries to recover from the shocking death of her friend. She meets the ghost of a punk rocker who warns her about the headless motorcyclist, known in the Shadowlands as “The Reaper”. Christina isn’t sure if what she saw that night on the beach was real or if she was just hallucinating. She consults with Madame Chloe, a spiritual medium, to figure out what is going on. For readers not familiar with Asylum Press books, the publisher is offering a 5-page preview of Chopper #1 and #2 online at www.asylumpress.com/titles/chopper. If you’re on the fence about trying a book from a smaller publisher, be aware that Diamond gave both Chopper #1 and Chopper #2 a “Certified Cool” in its Previews catalog. We’re also proud to announce that the movie rights to Chopper have been sold, and the production company has already shot and released a live-action web TV series in October to introduce fans to the Chopper mythology and build awareness for an upcoming movie in 2012. The web series stars Tyler Mane (played Michael Myers in Rob Zombie’s Halloween remake, and Sabretooth in X-Men) and Andrew Bryniarski (Texas Chainsaw Massacre, Batman Returns). It features all-new prequel story material not in the comic book that will explore the origins of the Reaper and shine a light on the unknown pasts of several key characters. Visit www.chopperlives.com for more info. Chopper #3, a 32-page full color comic book for $2.99, can be pre-ordered from your local comic book shop (www.comicshoplocator.com). This title carries a Diamond Order Code of DEC110840.